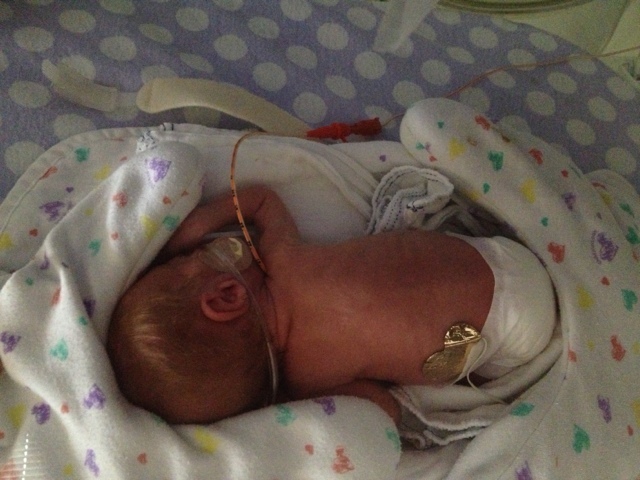 Briella's Journey: We Have a 2 Pound Baby! Briella weighs 910 grams...or 2 pounds!! She is so incredibly physically strong! She is pushing herself on all fours. She squirmed up like 4 inches today! I have a video of her doing it and it looks like she is trying to crawl to reach her binkie. Also, big news, today Briella was able to move her eyes to follow her nurse!! Her nurse moved to throw something in the trash can and she screamed "look she's tracking me!" That means Briella is at least not completely blind!! Also, today when I said something to her louder than I usually speak, she shook like she had been startled. So I believe she can hear also. Today we were able to see the pictures of her ultrasound of the brain. These bright spots are actually white areas on both sides of the brain. It could mean 4 different things. 1 of those 4 are pretty dang scary. I was proud that I didn't completely lose it while talking about it. Brian was there with me so that helped. We are hoping for the best outcome which would be for the spots to go away. They aren't planning to do another ultrasound. Just the MRI before we go home. Please please please continue to pray that Briella stays infection & NEC free and that the bright spots in her brain disappear. Picture if Briella sleeping, holding her white binkie in with her forearm. Continued thoughts and prayers as we follow your story. Briella never ceases to amaze me! She is so so strong.